When you set this toggle to the ON position (default) the rideshare trip request sounds will be audible to you as they normally are. However, when this toggle is set to the OFF position the rideshare trip request sounds will be muted by the Mystro app. Watch this video for more on RIDESHARE APP SOUNDS. When this toggle is set to the ON position, Mystro will say “Trip Accepted” when it auto accepts a trip and it will say “Trip Ignored” when a ride request comes in that doesn’t match the preferences you've set. Watch this video for more on TRIP ACCEPTED. Watch this video for more on TRIP IGNORED. (When activating this feature for the first time you will be asked to give Mystro access to your Android device microphone). When this toggle is set to the ON position you can say "ACCEPT TRIP" and Mystro will accept the trip being ignored. Mystro will then accept the request and you can be on your way to pick up your passenger. 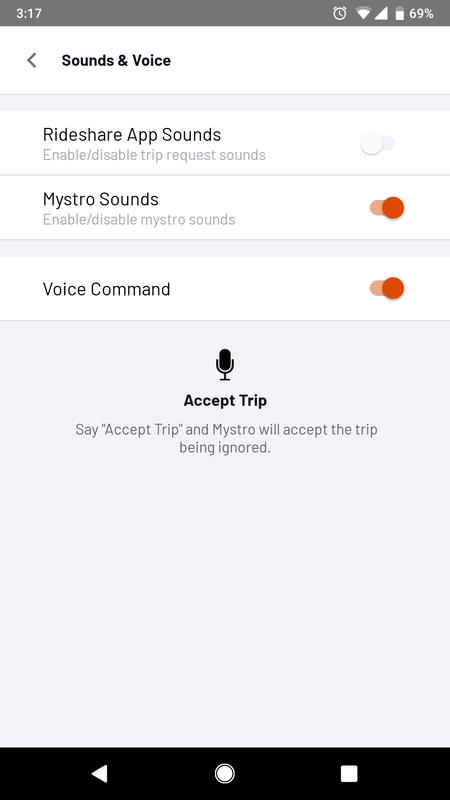 Say "Accept Trip” and Mystro will accept the trip being ignored.